It’s my blog’s birthday (terrible two! ), it’s Friday, and I have a spare copy of this book. What better reasons are there for a giveaway? If you are interested in sustainable fashion and fair trade (which I gather you are as you are reading my blog!) then Naked Fashion is the book for you. 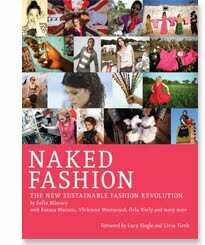 It’s put together by Safia Minney of People Tree and features heaps of info and images about fair trade and interviews from all sorts of people who are working to make the fashion industry kinder to the planet and its people. There’s even a double page feature by me! (Look, I’m on this list of contributors!) I talked about how I worked with People Tree and Japanese Vogue on a designer collaboration a few years ago. And there’s a photo of me in there by Cheryl of Busichic! The giveaway is for anyone living in Australia and all you have to do is leave me a comment by next Friday (February 10). You can comment here on my blog, on my Facebook page, or on Twitter ( @Leeyong_Soo ), or even send me an email (fourthdaughter@gmail.com). Go, go, go! I'd love to be in the draw to win a copy, looks like a great book. Congrats on your bloggy birthday!